Two key moments summed up Dawes performance on the opening night of the Shrewsbury Folk Festival. Only a few songs into their set, frontman Taylor Goldsmith almost apologised for their presence by indicating that ‘underneath all the electric and amplification these were just a bunch of folk songs.’ Upon completion of their scintillating performance, compere Steve Knightley strode onto the stage adding nothing more than proclaiming ‘that was a band’. 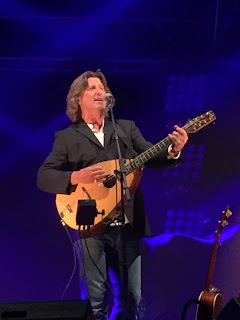 What the main stage had just witnessed was a sublime exhibition of classic American folk rock, bristling with spellbinding musicianship providing a magnificent backdrop for Goldsmith to wrap his unequivocal vocal style around a deluge of top rate songs. The booking may have been a left field choice and a desire to unleash a dose of West Coast folk rock on festival goers, but the sheer class of Dawes paid off the decision tenfold. Attendance at this four day festival over the August Bank Holiday weekend was curtailed to just the Friday evening this year and, with the subsequent start time and line up, it effectively became an extended gig rather than the full feel of a folk extravaganza. Between the hours of 7:30 and 11:30, with minimal changeover slack, the scheduling of Steve Knightly, Kate Rusby and Dawes was met with agreeable approval. The contrast and balance of the three acts showcased differing sides of the genre with the ultimate common theme being the unmistakable proven calibre and quality. The capacious main stage marquee was the suitable venue for this trio of performers and reception from a packed audience paid full respect to each style. Steve Knightley was of course no stranger to this and any other festival crowd. Pairing up compere duties with a solo ‘Show of Hand’ performance was natural territory for this charismatic performer, although the solo status was relieved for the final couple of songs when a junior Master Knightley joined his father to play the Cajon. The audience required only the faintest invitation for their vocal participation to take effect and this rarely relented during the hour that Steve was on stage. His whole persona in the spotlight was endearing, captivating and charming, presenting an artist on top of his game for well over twenty years. The passion, fire and humour was alive in equal portions as set topics included early gigging in Portsmouth, wishing great songs had been written by him and the 2008 banking crisis. Like so many folk artists, Steve had been active in communicating songs to commemorate the centenary of The Great War and ‘The Lads in Their Hundreds’ was shared with the good folks of Shrewsbury this evening. ‘(Let Me Go) Sweet Bella’, ‘Arrogance, Ignorance and Greed’ and ‘Cousin Jack’ were among the most rapturous songs lapped up by the crowd with the latter acting as a self-engineered encore performance. Well Steve was compering so it was his rules. The choice of Steve Knightley to kick the festival off was a no brainer by the organisers and the mood in the main marquee was bubbling as we settled down for the second top class act to appear. 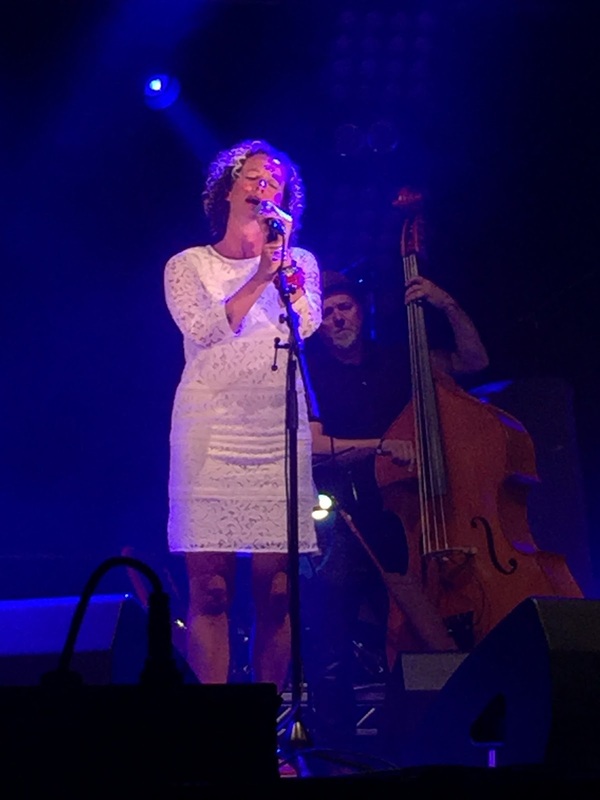 Kate Rusby, in her witty Yorkshire brogue, reminisced that her recording and touring career has now twenty three years in the bank with the passage of time certainly being kind to her career. If veteran is a little harsh word to use, maturing is more appropriate to describe Kate whose every accolade has been fully deserved and earned. 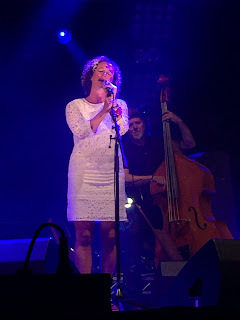 For this return to the Shrewsbury Folk Festival (her 2012 appearance had the house full sign up outside the main marquee), Kate was joined by her cherished five piece band led by husband Damien O’Kane. They added a wealth of experience, class and panache to a host of self-penned and traditional songs all beautifully executed by the polished and stylish vocals of Kate. For an hour and a quarter Kate interspersed nine songs from her extensive back catalogue with revealing tales showing her proud allegiances and roots of influence. She briefly left the stage for the guys to jam away to a set of folk and roots tunes before returning with one of her crowd favourites ‘Awkward Annie’ to send folks away fulfilled. For the majority of her set, Kate kept it contemporary by turning to six songs from her latest album GHOST which included the title track preluded by recollections of her haunted property. ‘Three Jolly Fishermen’ was the pick of the songs from this album and now we are certain of its Whitby origin courtesy of the persuasive Kate. To complete the tunes lifted off this 2014 release we enjoyed listening to set opener ‘The Outlandish Knight’, ‘The Night Visit’, ‘Silly Old Man’ and ‘We Will Sing’. To say that Kate is a much loved member of the English folk circuit is an understatement and tonight the warmth of her approach to music would have flowed straight to the hearts of fans old and new. Since releasing their first two albums in Europe on the respected UK record label Loose Music, Dawes have been a bit quiet on this side of the pond in contrast to their rise back home in the States. 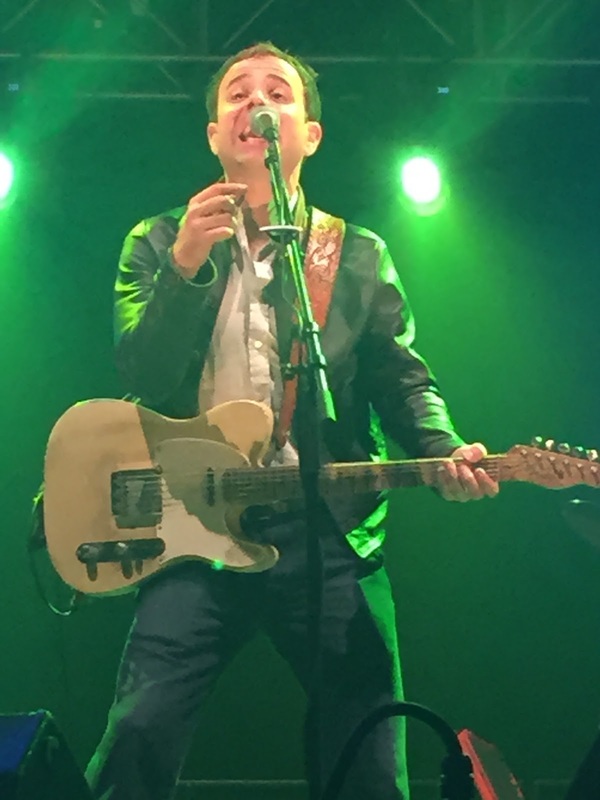 Therefore this led to the five piece band led by prime singer, songwriter and guitarist Taylor Goldsmith taking a cautious approach to minimal inter-song communication preferring to let their music assume its rightful place as the driving force of a Dawes stage show. When you have such an exquisite toolkit of sensational guitar combination, the dual evocative finesse of keys and organ, all held together by powerful percussion, the network is secure to bring the stimulating songs of Goldsmith to light. All four Dawes albums to date were featured in their hour and a quarter headline set with especially a few from the latest release ALL YOUR FAVOURITE BANDS leaving a marked effect on audience members. It was a pity that the CD version of this record was missing from the merchandise tent, although plenty of folks were milling around the other album copies after the show. The title track from the new record proved to be the band’s finale with the witty chorus line raising many a smile from the crowd. Earlier Dawes had announced their arrival with the outstanding ‘That Western Skyline’, a song heralding that West Coast feel to this tightly knit combo. This song saw first life on their debut album NORTH HILLS, a record which was later celebrated in the set with a resounding rendition of ‘When My Time Comes’. As indicated, a humble Goldsmith kept the chat brief, but was not short on extolling his gratitude for the festival invite. What better way to extend his thanks by serving the audience with three more memorable numbers from the new album in the guise of ‘Things Happen’, ‘To Be Completely Honest’ and, standout candidate of the night, ‘Somewhere Along the Way’. Elsewhere one of the few tracks to get an introduction saw Goldsmith explain the flying connection to ‘From a Window Seat’ and quite simply give the title to their cover of The Waterboys ‘Fisherman’s Blues’. Whether a cover was needed from such an intelligent and vibrant songwriter as Taylor Goldsmith was debatable, but it far from defines the outstanding song craft housed in their growing back catalogue. Of course being confined to a solitary marquee for an evening didn’t allow for the full festival experience which no doubt many folks enjoyed over the weekend. However available time was maximised in the best possible way with around three and a half hours of A* music by a trio of primed top class performers being served on a plate. The organisers got it precisely spot on with the scheduling of Steve Knightley, Kate Rusby and Dawes. Maybe circumstances in the future will enable the full festival to be enjoyed, but for the moment this gig-like evening will linger long in the memory.